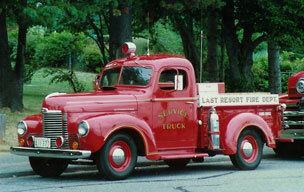 Truck references and analogies have been a surprisingly frequent motif in the Apple-oriented blogosphere lately. Last Friday, T-GAAP's E. Werner Reschke posted a screed entitled Hi, My Name Is Werner. And I Am a Truck, riffing on a Steve Jobs analogy dating back to 2010 proposing that tablet computers like the iPad are like cars - good for the sort of computing and communicating most of us do most of the time - while PCs (in this context, traditional desktop and laptop computers, whether Mac or Windows) are best for doing a lot of heavy lifting and performing special functions in which they're increasingly being used like trucks - only occasionally to be called upon when extra utility and power are required. "When we were an agrarian nation, all cars were trucks," Jobs is cited musing. "But as people moved more towards urban centers, people started to get into cars. I think PCs are going to be like trucks. Less people will need them." Aside from the grammatical blooper (he should have said "fewer" not "less"), I don't think the analogy holds water that well. Is Jobs oblivious to the fact that more trucks are being used for daily transportation in urban settings by noncommercial users than ever before in history? However, these sorts of references resonate with me as a crossover computer/automobile aficionado. Strictly speaking, Werner Reschke says he's not really a truck, but in Steve's analogy he'd be more of a truck driver, and even though he uses a car (an iPhone 4), he has yet to find a need or feel a real desire to buy an iPad. When he needs to be working or computing while mobile, his MacBook Air is an easy carry-along, while for browsing or email on the go, the iPhone does great, so he can't see where the iPad fits into his life, since it duplicates his MacBook Air's functions to a degree but still doesn't do all he needs a "computer" to be able to do. Given his particular needs, Werner says he's essentially a truck guy and likely to use a "truck" computer until he retires. 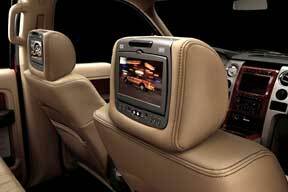 I think many Apple fans are finding themselves torn between the car/truck computing paradigms these days, and actually, the dichotomy is one that affects the actual world of four-wheeled cars and trucks these days too. Personally, I own both a truck and several cars, and I wouldn't want to have to settle for just one or the other. On the other hand, I've up to now been a thoroughgoing trucker when it comes to computing, having neither an iPhone (no wireless cell provider support for the iPhone where I live) or an iPad, although I'm seriously wavering on the latter. 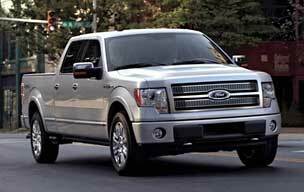 2011 Ford F-150 Eco-Boost "A Testimony And Validation To The Macintosh Way"? "It never fails," says AutoSpies' Agent 001. "When I have a car I want a truck and when I have a truck I want a car . . . Can you relate to this?" "[If you've] been reading on AutoSpies.com, you know Agent 001 just traded the 2010 911S for a 2011 BMW 335d," he says. "But what you don't know is that about 45 days ago I quietly added the all new 2011 Ford F-150 XLT Supercrew Eco-Boost 4x4, 157" long bed to the stable." Agent 001 says that the 2011 Ford F-150 pickup, especially with the fuel-efficient and astonishingly powerful new Eco-Boost V6 engine, is a testimony and validation to the Macintosh way of taking something really good, endlessly perfecting it over time, and delighting and enchanting the customer. Agent 001 loves his F-150. I completely understand. I'm not a big fan of its exterior styling (although the inside is especially nice). 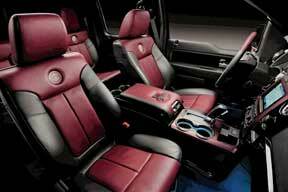 Interior views of Ford F-150 Supercrew. More on truck styling in a moment, but in my estimation as a lifelong automobile enthusiast and critic, the current Ford F-series pickup trucks are the class of the field, and it's not for nothing that Ford's F-series has been not only the best-selling pickup truck for some 45 years, but more often than not the best-selling vehicle in North America overall. As Agent 001 observes, "If all American vehicles were this well thought out and performed as well, Toyota and Honda would still be a blink in the night." He advises that pretty much the best way to see how good this truck is and how badly it slaps the others is to watch the torture test video series about the new Eco-Boost six-cylinder in the F-150 on the Ford website. I concur. Prepare to be impressed. Even if you're not currently shopping for a truck, you really want to check this out. Or, in case you don't have the 10 minutes or so to spare downloading and viewing the six video clips, here are the broad strokes: Ford engineers pulled 3.5 liter Eco-Boost six-cylinder serial number 448AA off the production line in Cleveland, and proceeded to run it for the equivalent of 150,000 miles at high load on a dynamometer, simulating alternating extremes of high and low temperatures. Then they dropped the engine into an F-150 and drove it 1,900 miles, including over the Rocky Mountains, to Oregon, where they subjected it to skidding 55 tons of logs (some of them weighing more than the truck itself) up a steep grade dragging on the ground. That test successfully executed, they drove the truck 3,300 miles back across the country to Homestead-Miami Speedway in Florida where they ran it flat-out around the circuit for 24 hours, towing a trailer loaded with two NASCAR stock cars for a total trailer weight in excess of 11,000 pounds, stopping only for fuel and tire changes. Then back across the country yet again to participate in a "torque sprint" against Dodge RAM and a Chevy Silverado pickups powered by 5.7 and 5.3 liter V8 engines respectively, towing 9,000 pound trailers up a 10-mile grade, in which the Eco-Boost V6 dusted both V8 competitors by substantial margins. Then down to Baja, Mexico, where Eco-Boost 448A was removed from the F-150 and dropped into Mike MacCarthy's custom-built Ford pickup off-road racer to run in the grueling Baja 1000 at speeds up to 100 MPH, again finishing with flying colors. The engine was finally shipped back to Detroit after the equivalent of 165,000 miles of largely brutal abuse, where it checked out on the dyno as still exceeding its advertised torque and horsepower specifications. Finally 448AA was taken to the North American Auto Show for a public teardown, in which it was examined and measured for wear, with the critical internal specs. found to still be within production tolerances. As I said, impressive, and it should put to rest any doubts about the turbo engine's ruggedness and dependability, about which I admit to having been a cautious skeptic. Agent 001 is also stoked on Ford's SYNC technology, with which he says that even if you don't buy the full nav system, you still get a really good and useful (although only text directional and voice) navigation solution. Ergo, just hit one button on the steering wheel, say "SYNC services", and it makes a call and voice prompts you through the whole thing so you don't have to remember a bunch of specific voice commands. 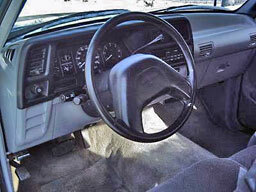 It then downloads the nav instructions into your phone, and built-in Bluetooth shows it through the text display in the center stack, with voice instructions coming through the sound system. Pretty amazing considering that the SYNC option costs only $275 and requires no monthly subscription. You can read Agent001's 2011 Ford F-150 Eco-Boost review, profusely illustrated with great photos of the F-150 from San Diego and the surrounding areas on AutoSpies.com. 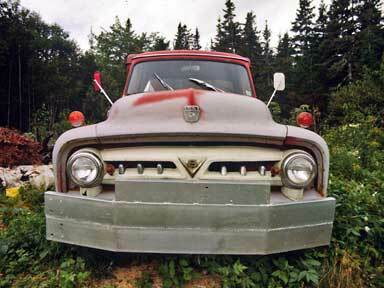 I'm a big fan of pickup trucks, but as I alluded to above, it's more often than not in spite of rather than because of the way they look. There have been exceptions, of course. In my estimation the quintessence of what a proper light-duty truck should look like is embodied in Ford's 1949 through 1956 F-series pickups. That may be partly due to my time and very early impressions, since I lived through the last six years of that interval and can't remember when I wasn't a truck fancier. However, there were lots of other trucks around when I was a kid and I never thought any of the others looked as good as the Ford. First runner-up, I guess, would be post-World War II International Harvester pickups up to 1968, after which IH threw in the styling towel and went with a slab-sided three rectangular box un-design that looked like it could've been drawn by a creativity-challenged six-year-old. 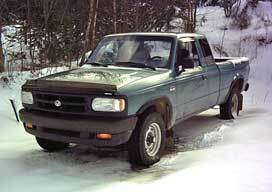 Perhaps not coincidentally, they were the last series of pickups before IH abandoned that market segment. Appreciation of style is a subjective thing. The average person has little or no knowledge about the technical aspects of design, but just about everyone knows what they like and don't like aesthetically. However, while there is no definitive "right" or "wrong" in stylistic aesthetics, there is often a fair bit of consensus. For example, most people seem to think Apple does a consistently better than decent job with the industrial design of its hardware products. I don't think I've ever heard anyone - not even hard-bitten PC partisans - say they don't like the looks of the MacBook Air. Aluminum unibody MacBook Pros also get pretty unanimous accolades. I love the look of my Late 2008 Unibody MacBook, although the white version of the iPad 2 is the first tablet computer iteration that's really appealed to me. Back to pickups. I've only owned one of those classic-era F-series Fords, a 1953 three-quarter ton F-250 that was an amazingly satisfying highway vehicle as well as a formidable hauler. 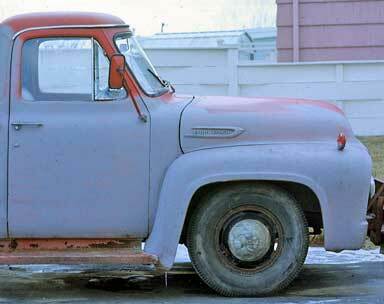 However, I spent a lot of time in 1950 and 1953 F-100s belonging to friends. The '53 had the indignity of a swapped-in General Motors inline six cylinder mill, but it was still a nice truck to drive and look at. My own '53 F-250 and the 1950 F-100 both had classic Ford flathead V8s, a delightful powerplant whose smoothness and quietness wouldn't have been out of place in a luxury car. Unfortunately, Ford pickup styling went from sublime to less than mediocre literally overnight with the 1957 model year, and it stayed that way through most of the 1960s, 70s, '80s, and '90s. Not that the competition was much better. General Motors had a brief renaissance of pickup truck good looks from 1967 through 1972, after which they reverted to mediocrity. 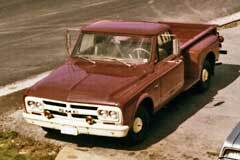 The best-looking trucks of the subsequent period IMHO were the Dodges of 1973 through 1993. 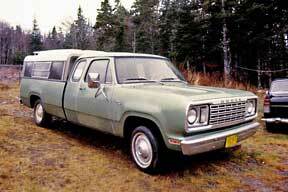 I owned a 1977 D-100 whose styling I genuinely admired and never got tired of. The best you could say of contemporaneous Fords and GMs styling-wise was that they were at least unpretentiously utilitarian in appearance. Not so the next phase, ushered in by Chrysler with its "big rig look" 1994 Dodge RAM pickups. From a marketing perspective, this departure paid off big time for Chrysler, which nearly doubled its pickup truck market share after the restyling, but it didn't appeal to me in the slightest. Adding insult to injury, aesthetically speaking, Chrysler had an extremely attractive, clean-looking, and original pickup design in the works that was abandoned and superseded by the Kenworth wannabe caricature design. At least the first iteration was done with a modicum of restraint. Meanwhile, General Motors had gone with a more car-like styling on its 1988 pickups, and today, two generations on, the Chevy and GMC pickups of 2011 remain derivative of that restyling, with, in my estimation, the middle-generation being the most successful of the three takes. A friend of mine has one of the current model Chevy Silverados, which I think is awkwardly and pointlessly ugly. Ford, on the other hand, did a relatively pleasant and original restyle of its pickups in 1997, featuring sleek, rounded lines, and that survived several facelifts before finally capitulating to the Dodge-initiated trend of making its trucks look like Transformers cartoon caricatures with a major restyle in 2009. 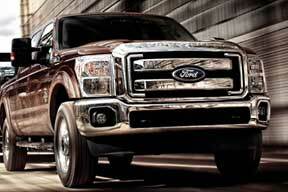 The current Ford Super Duty F-250 and F-350 models are the most extravagantly exaggerated examples of the genre yet. I thought Peter Egan of Road & Track magazine captured the dynamic nicely in his comment that having one of these late-model pickups in his rear view mirror puts him in mind of the living room fireplace mantelpiece following him down the road. Frankly, I think the current batch of full-sized pickups from all of the Detroit big three are all ugly, the Ford F-150 being the best-styled of a mediocre lot, with the Japanese (albeit American-built) competition from Toyota and Nissan even more nondescript, but at least inoffensive. The midsized and getting-long-in-the-tooth Dodge Dakota is probably the best looking pickup from the Detroit big three currently. However, styling notwithstanding, if I were shopping for a new pickup today, I would head directly to my nearest Ford dealership with no other stops necessary. In reality, my own current pickup is a 1994 badge-engineered Mazda clone of the long-running Ford Ranger compact pickup that I definitely didn't buy for its looks. For me, a real truck has a plain vinyl bench seat, rubber floor mats you can clean with a garden hose, rear pontoon fenders, running boards, and a manual stick shift. My Mazda has an interior that wouldn't be out of place in a midsize Japanese sedan, with pile carpet not only covering the floor but halfway up the insides of the cab, reclining seats with a fold-down armrest, and an automatic transmission. Indeed, it bears noting that Ford currently sells no F-series pickups with manual transmissions at all, although the TorqShift 6R six-speed automatic transmission for 2011 features a manual mode. 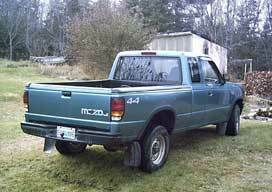 Interestingly, despite its totally aimless styling and car-like interior, my Mazda has been a surprisingly good truck. In terms of size and carrying capacity it actually reminds me of those early 1950s F-100s. If I had to choose one or the other, I would go with a truck, and the same holds true for the computer analogy. I can't imagine being able to get along without a reasonably full-featured laptop, although a "compact truck" like a MacBook Air would likely prove more than adequate for my needs, especially if the price of larger-capacity SSD drives eventually climbs down from the stratosphere. As for whether I can live happily with a "car" computer, I'm almost decided to take the plunge and find out with an iPad 2.